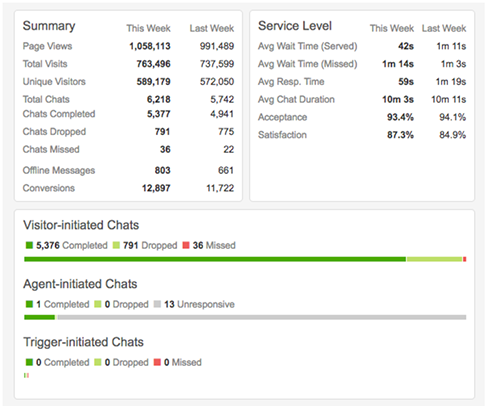 The Weekly Analytics Report contains an easy-to-review summary of the chats your agents have had over a one-week period. It's emailed to admins once a week. Page views: The number of page changes detected by the widget across the website. Total visits: The number of visitors who have already previously visited the site. Total chats: The number of chats initiated. Offline messages: The number of offline messages sent via widget during the time period. Chats completed: The number of chats which end with a reply from an agent. Chats dropped: The number of chats which end with an visitor message that remains unanswered by the agent. Chats missed: The number of chats where the agent does not answer the incoming chat request and the visitor subsequently leaves. Conversions: The total number of conversions (unattributed and attributed) recorded during the time period. Average wait time (Served): The average length of time for all chats an agent participated in. Average wait time (Missed): The average duration of chats that were not answered by an agent (from initiation by visitor to drop by visitor). Average resp time: The average time it takes for an agent to respond to messages in a chats. Average chat duration: The average total length of time for chat sessions. Chat duration is calculated by subtracting the timestamp of the first message from the timestamp of the last message. Acceptance: The percentage of chats accepted by agents. Satisfaction: The average satisfaction rating by visitors. The report also shows individual agents ranked by performance metrics, such as those with the most chats, shortest response times, or fewest dropped chats. Nora, where do I find this report? You enable reports from the Settings > Personal > Email reports page in Zendesk Chat. If any specific user is visiting my webpage repeatedly, say 10 times per day, will that "10 visit" from same user be counted under "Page Views" or "Total Visits" or "Unique Visitors"? What would you say is an "acceptable" number for chats dropped, proportionally vs completed? The glossary defines "dropped" this way "The number of chats which end with an unanswered visitor message" so is it reasonable to think that if our team are doing their job as best they can, then there should not be any dropped? Wouldn't it be normal to aim for every visitor message to be answered? I'm trying to understand how hard i should push my team and where the targets can realistically be set. That's a really good question, and not an easy one to answer, especially since Dropped usually means the visitor simply answered "you too" to the agent's farewell greeting. It is not necessarily a sign that the agent is inattentive. I don't think it is a good metric for measuring agent or team quality, since as I see it, the customer in most cases has not had the experience of being "dropped" - it is just a case of bad agent/visitor timing. And maybe also limitations in the agent interface. If you see chats being dropped, where the visitor is having a bad experience I can see pursuing a lowering of the dropped percentage, but I would rather focus on Customer Satisfaction and Response time / Wait time improvements in most cases. How can I view the average (also Max and Min) number of Concurrent chats for an Agent? can it be added to this report or viewed in another?